For the first time in World Cup history, not a single side from the northern hemisphere will be represented in the last four and southern media has been analysing the reasons why. While the postmortems have already stared on these shores why Ireland succumbed to a hugely disappointing defeat at the hands of Argentina in Cardiff on Sunday, media in New Zealand, Australia and South Africa have been discussing the disastrous showing from the Six Nations representatives. Club structures, risk-free game-plans, injuries and attritional rugby have all been put forward as possible reasons. Stuff.co.nz pulls no punches in its assessment of rugby in the northern hemisphere, though Wales, Ireland and Scotland are given some degree of credit following their respective World Cup exits. "Italy, France and England were dire," they write before adding Wales, Ireland and Scotland "played with heart". In assessing the downfall of Joe Schmidt's side, injuries and suspension were considered factors, but ultimately it was the conservative game-plan which culminated in the comprehensive Argentinian defeat. "Ireland made two line breaks against the Pumas. Down by 20 points, their idea of chasing the game was to kick for territory. Sure, they were missing four key players - Paul O'Connell, Jonathan Sexton, Peter O'Mahony and inspirational flanker Sean O'Brien - and their backs tried hard, but the contrast was clear." Over in The New Zealand Herald, Argentina's decision to compete in the southern hemisphere rather than the north has been lauded. 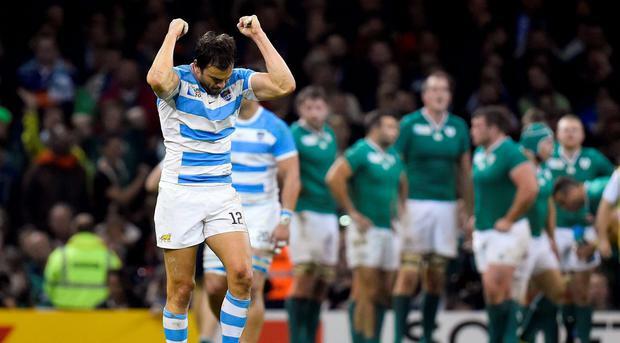 In an article titled 'Argentina's Six Nations snub vindicated', the paper says Los Pumas have reaped the awards from what was effectively a Six Nations snub eight years ago. "Driven by how many of its players were based in Europe, Argentina approached the Six Nations committee in 2007 after reaching the World Cup semi-finals for the first time, virtually begging to be allowed to join the northern hemisphere tournament," they write. 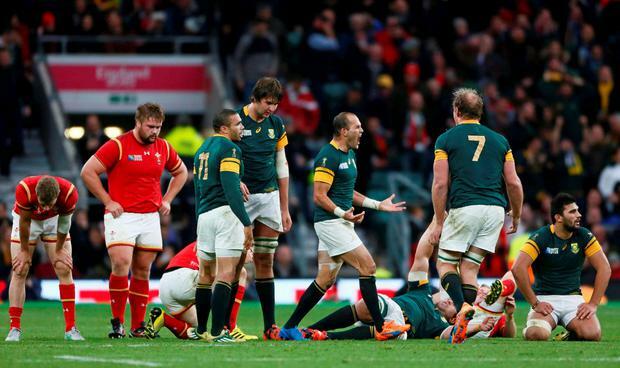 "But they were spurned by the European nationals and instead turned their focus towards Sanzar's Rugby Championship. "It has proved an inspiring decision." The Australians can count themselves fortunate to remain in the World Cup themselves, with Craig Joubert's decision to award the Wallabies a last-minute penalty, which Bernard Foley dispatched with aplomb to break Scottish hearts, an incorrect one as World Rugby admitted yesterday. Nevertheless, it doesn't dilute the fact that the southern hemisphere is very much in the ascendancy, with Fox Sports Australia suggesting the good weather present during the competition proved to be a hindrance for the Six Nations sides. "The lack of rain during this World Cup hasn’t helped northern teams," the website suggests. "Rain and wind can be a leveller in northern vs. southern hemisphere match-ups, curtailing the generally more expansive approaches of the southern teams and favouring European teams which often revel — and are experienced in playing — in poor conditions." Interestingly, the lack of an expansive game-plan, they argue, could be a contributing factor to the reason both Wales and Ireland were crippled by injuries during the competition. "Wales and Ireland will point to injuries hindering their chances this World Cup but doesn’t their physical, crash-bang approach increase the chances of injury?" The Springboks are gearing up for a tilt at the All Blacks this weekend and will have to re-address a poor run of results against the reigning champions if they are to reach the World Cup Final. In dissecting the reasons why all four southern hemisphere sides have reached the last four of the tournament, South African sports website Super Sport 24 suggest that club priorities are impacting negatively the respective national sides. "The performances of the Northern Hemisphere countries will no doubt once again call into question the current club structure in Europe, with the massive influx of overseas players having a detrimental effect on the various national teams. "Foreign players bought at great expense by teams in England and France in particular take the place of local players, thus denying them the opportunity of gaining much-needed experience and game time. "Whether anything is done to address the current plight ahead of the 2019 World Cup in Japan remains to be seen." Steffon Armitage has branded England stars supporting his World Cup exclusion as "pretty insulting". Gavin Mairs Dropping a goal from 40 metres just as Australia were threatening to stage a remarkable comeback may have been Dan Carter’s ­crowning moment on Saturday.